Amy Schombs is Jewish, her husband is Catholic, and they face a holiday dilemma: This year, Hanukkah and Christmas overlap. So on Christmas Eve, they and their four children will attend Mass as they do each year, then return to their home in East Northport and, after a special meal, kick off the eight-day Hanukkah celebration. For many interfaith couples on Long Island, the coincidence poses a juggling act that some are embracing and others wish was less complicated. Hanukkah, the “Festival of Lights” marking the rededication of the Temple of Jerusalem in the second century Before the Common Era, starts Dec. 24 at sunset. That’s the time many Christians will head to church for Christmas Eve Masses heralding the birth of Jesus on Christmas Day, one of the holiest days of the year on the Christian calendar. Schombs, co-chair of the Interfaith Community of Long Island, whose members teach their children both the Jewish and Catholic faiths, finds this year’s observances challenging. The group is based at the Brookville Reformed Church in Brookville. The Schombs’ recognition of both holidays is displayed on the family’s front lawn, with inflatable animals and items signifying Hanukkah and Christmas. There are dreidels, a huge dog wearing a yarmulke and holding a Star of David, a giant Snoopy dressed as Santa, and “Star Wars” character Darth Vader in a Santa hat. Barry and Peggy Saffren of Sayville are taking the overlap in stride. They have a menorah in their window, a Christmas tree in their living room and Christmas lights outside the house. 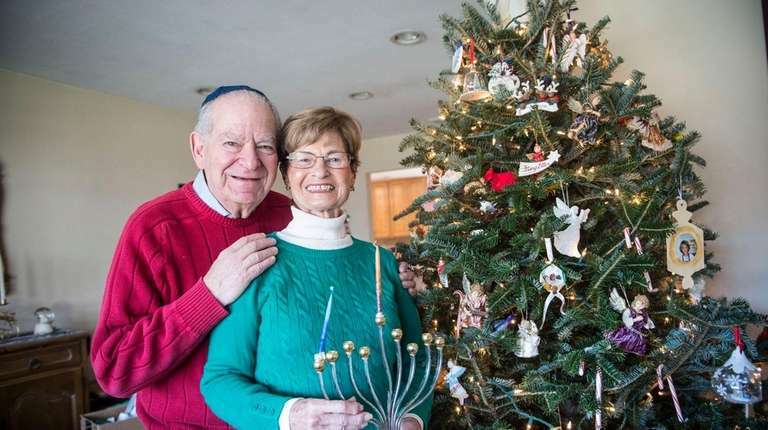 They will attend the B’nai Israel Reform Temple in Oakdale on Friday night for regular Sabbath services, kick off Hanukkah Saturday night at home by lighting their menorah, and then attend Mass on Christmas Day at St. John Nepomucene Roman Catholic Church in Bohemia. “It’s very nice,” Barry Saffren said. “It’s nice it’s the same day as opposed” to being separated by weeks, which happens in many years. Hanukkah, which recognizes the Jerusalem temple’s rededication at the time of the Maccabean revolt those centuries ago, ends on Jan. 1 at sunset. According to the Talmud, after Jewish warriors regained control of the temple, one night’s worth of oil for the temple’s menorah miraculously burned for eight days, filling the sanctuary with light. To commemorate the event, Jews light one additional candle on the menorah each night of Hanukkah’s observance until all eight candles are ablaze. The faithful also celebrate the holiday by saying prayers and blessings at home, eating traditional foods cooked in oil, such as potato latkes and jelly doughnuts, and having children play with dreidels. It is not among the holiest of Jewish holidays, such as Rosh Hashana and Yom Kippur, but it is among the most popular. While there are clear differences in the holidays, there are similarities, he said. “In the darkness of the winter, in the cold of winter, in the bleakest time of the year, a religious message comes out from the two faith communities, each speaking their own language, that tells of hope, that ignites a sense that God’s presence is with us,” Klein said. Julio Yacub of Holtsville devised a solution for himself and his wife that literally ties the two holidays together. Yacub, who is Jewish, was born in Argentina and has lived in Israel. His wife, Maura, was born in Colombia and is Catholic. Around the Christmas tree in their home, Yacub looped a string that has small Stars of David hanging from it. Schombs said she and her family will celebrate Hanukkah on Dec. 24 by handing out presents to her children, then give more gifts to them on Christmas Day. On Dec. 26, it will be back to the Hanukkah celebration when she gets together with her extended family to celebrate the Jewish holiday some more.